Delrin® nose prevent marring of aluminum, brass or other soft materials. Hex Drive Plungers use a positive drive for insertion and removal. Plungers may be ordered with or without the locking element. 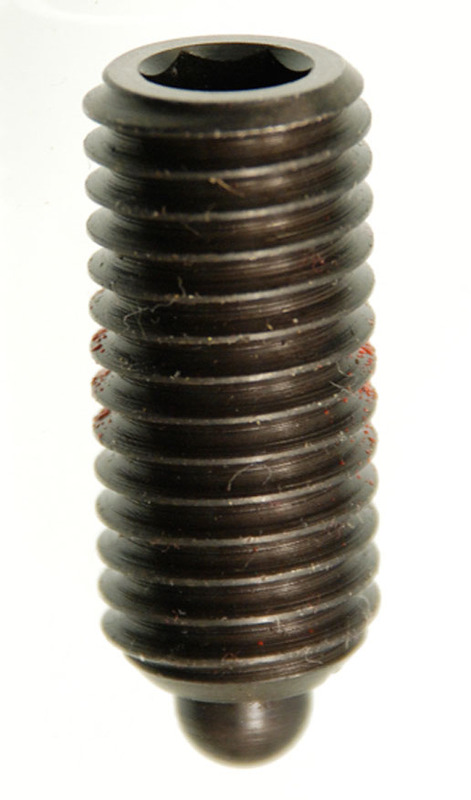 Plungers without locking element are the same price, but are considered "specials" and cannot be returned. We recommend using without the locking element for applications in aluminum. The Nylon locking element holds the plunger body securely in place witout the need for lock nuts or other devices. We recommend a 90° countersink 1/32" larger than the major diameter of the mating thread to prevent damaging the element. End pressures are given in pounds. Full pressures are the force pounds needed to move the nose to the distance show in "C" column.